In a small army field-hut Dr Arjen de Vos shows off his irrigation machine with pride. Pipes lead out to several acres of muddy field, where only a few stragglers from the autumn harvest of potatoes, salads, carrots and onions are left. The tubes are lined with copper to stop corrosion because – in a move that defies everything we think we know about farming – de Vos is watering his plants with diluted sea water. Here, on one of the Netherlands’ northernmost islands, windswept Texel (pronounced Tessel) surrounded by encroaching ocean and salt marshes that seep sea water under its dykes and into ditches and canals, an enterprising farmer has taken the radical step of embracing salt water instead of fighting to keep it out. And now he thinks he might just help feed the world. Inspired by sea cabbage, 59-year-old Marc van Rijsselberghe set up Salt Farm Texel and teamed up with the Free University in Amsterdam, which sent him de Vos to look at the possibility of growing food using non-fresh water. 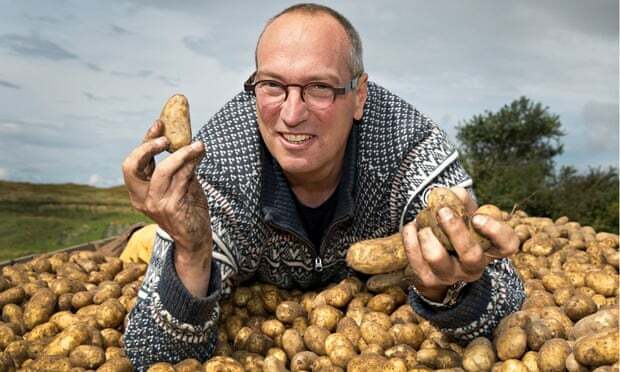 Their non-GM, non-laboratory-based experiments had help from an elderly Dutch farmer who has a geekish knowledge of thousands of different potato varieties. The scarcity of fresh water has been labelled as the planet’s most drastic problem by the World Bank, NGOs, governments and environmentalists. A fifth of the world’s population already lives in areas of drought, and climate change is only going to exacerbate the problem. Poor farming practices, along with road and pavement building, is raising water tables and increasing the salination of rivers and lakes – in the Western Australian wheat-belt alone, salinity has caused a 50% fall in the numbers of wetland bird species, and threatened 450 plant species with extinction. Attempts to desalinate sea water are going on around the globe – the UK has a £270m plant on the river Thames and Saudi Arabia produces 70% of its drinking water through desalination. But removing the dissolved minerals is expensive, requires much energy and the leftover concentrated brine has to be disposed of. The process is far too expensive to be used for irrigation in poorer countries. But thanks to a partnership with Dutch development consultants MetaMeta, several tonnes of the Texel seed potatoes of the variety Miss Mignonne, delivered by van Hijfte IJzendijke are now on their way to Pakistan where thousands of hectares of what until now had been unproductive land because of sea water encroachment have been set aside for them. If the experiment works and the potatoes adapt to the Asian climate, it could transform the lives of not only small farmers in Pakistan and Bangladesh,, where floods and sea water intrusion wipe out crops with increasing regularity, but also worldwide the 250 million people who live on salt-afflicted soil. But where does all that salt go? Aren’t we in danger of overdosing on salt if we eat the Salt Farm Texel crops? “What we find is that, if you tease a plant with salt, it compensates with more sugar,” said de Vos. “The strawberries we grow, for example, are very sweet. So nine times out of ten the salt is retained in the leaves of the plant, so you’d have to eat many many kilos of potatoes before you’d exceed your recommended salt intake. But some of the salads are heavy with salt, you wouldn’t eat them by the bucketful.